the LWF Assembly. Their artwork "illuminated" Easter worship services in Winnipeg and Geneva. One of the main features at worship services during the LWF Tenth Assembly in Winnipeg will be large candles bearing the LWF Tenth Assembly logo. These will be lit during worship in the various congregations, as a symbol of God’s moving spirit among people. The candles represent a much-valued tradition of handicraft workshops from the Evangelical Church of the Augsburg Confession in Slovenia. Organized by a dynamic group of women at congregations or wider parish levels, the workshops have a two-fold aim. They serve as a social point for congregation members as well as a market and exhibition stall for items that generate income for the church’s regular or specialized work. For the last five years, such workshops have been a central aspect for a group of women in Murska Sobota, northeastern Slovenia. Though a small community, it has been strengthened by the women’s activities in parish work including sharing the various skills that they are endowed with. One such talent is to decorate candles of all shapes and sizes. Murska Sobota’s women were enthusiastic about contributing their gifts to the LWF Tenth Assembly. 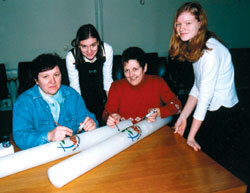 As a one-time project, they decorated ten large ceremonial candles with the LWF Tenth Assembly logo. With support from other churches, nine of these candles were shipped to Winnipeg so that they could be lit in congregations during Easter worship services and in the weeks prior to the Assembly. In this way, the Assembly already casts its light on the congregations that will be hosting delegates and other participants from the global Lutheran communion this summer. Prior to the Assembly, one of the candles will be lit in the Ecumenical Center Chapel in Geneva, where the LWF is based. During the Assembly, the candles will be "en-lightening" the services celebrated by a world-wide communion in Winnipeg, after which they will be returned to the congregations for use. The candles will be a lasting, tangible memory of the LWF gathering, of shared hopes and joint prayers, connecting people all over the world, from Slovenia to Winnipeg. The Evangelical Church of the Augsburg Confession in Slovenia has around 20,000 members, and joined the LWF in 1952.